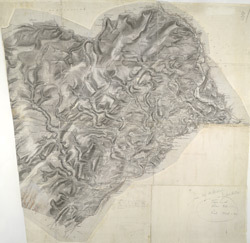 These field sketches of the Irfon Valley in central Wales were made on several pieces of thin and irregularly cut paper, joined and laid down on thick paper. The assemblage was cut into 12 rectangular pieces, each approximately 200 x 310mm, then remounted to form one sheet. The many pencil notes on the drawing were made before the sheet was cut. The map provides a good illustration of the convention of 'relative command', which indicates the relative height of the hills using black ink numbers: Hill 3 being higher than Hill 2, for example. Brushwork interlining and ink washes further depict relief.